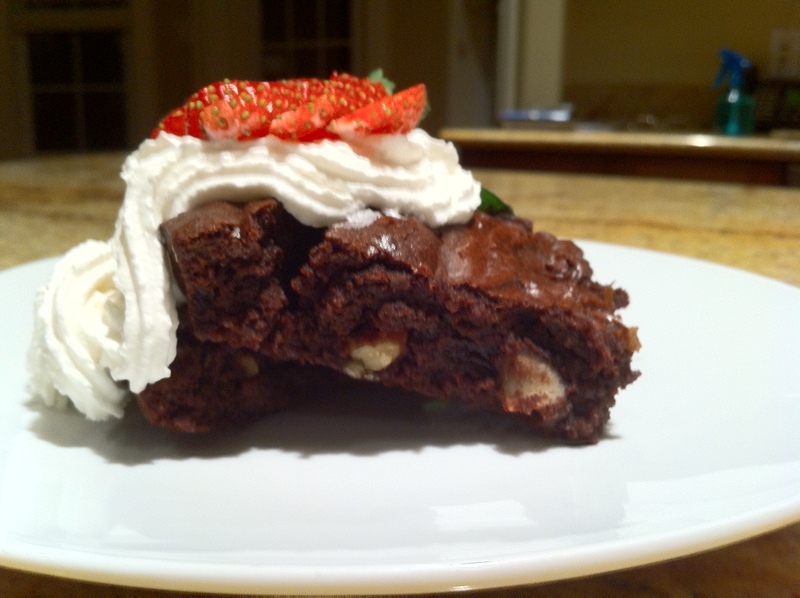 I decided to make these brownies after hearing all the fuss about them. They’re the cover image of the Bon Appetit magazine, but I don’t have a subscription. Luckily, it was available online! At first glance (the photo), these look like my kind of brownies (fudgy). I started out not liking brownies very much at all, but as I continue making them, I’m finding that I do actually like them… The picture showed walnuts, which I’m not a crazy fan of (yet, hoping to convert myself! ), so I subbed pecans and almond slivers instead! This was my first time ever browning butter, and it was a bit of a panicky moment. I didn’t know what to look for, and I just didn’t know what to do. I ended up looking up a video on youtube quickly, and that helped clarify things a bit more! The recipe was also written strangely, and so I’m re-formatting the ingredient list… Anyways, so the experience with browned butter turned out well! I ended up catching it at the right moment, and oh my god. It smells amazing. I just didn’t know something could smell that good. I don’t how to describe it really, it smelt… like caramel-y. People say “nutty”, but I can’t say it smelt nutty to me. Then again, I don’t sniff nuts in my spare time. I made sure to have all the ingredients prepared so that when I took the browned butter off of the element, all the ingredients could be incorporated quickly since the butter will continue to cook. Everything else went relatively smooth, except I had a larger/wider pan than called for so my brownies are a bit thin. Anyways, here is the recipe! My brownies are still in the oven right now as a I write this, so I’ll write about how they taste after the recipe! Preheat oven to 325F, and line an 8×8 metal pan with tin foil. Spray the tin foil with non-stick vegetable oil spray. Make sure to leave a 2″ overhang so that you can lift the brownies out. Melt butter in a saucepan over medium heat. Keep cooking the butter until it stops foaming. What you’re looking for here is for the colour of the butter to turn from golden yellow to brown. When you first start cooking, the butter will foam, stop foaming and bubble, then foam again. When you see that the liquid is starting to turn brown, promptly remove! Immediately add your cocoa, sugar, salt, vanilla, and water. Stir the mixture until it’s completely blended. Allow it to cool for five minutes. Once it’s cooled for five minutes, add one egg at a time to the batter. Make sure to beat vigorously so that the eggs are fully incorporated. Once the first egg is incorporated, add the second. After eggs are incorporated, the batter should look shiny and thick. Add your flour at this point and stir until it is blended, within 60 strokes. Add your nuts, then transfer to the baking pan. Bake for 25 minutes, or until a toothpick comes out almost clean. Cool the brownies in their pan, then lift the brownies out of the pan by the foil overhang. Cut them into 4 strips, and cut each strip into four. These brownies were so good. It’s unfortunate that only sixteen are made because I really just want to eat them all day… Except at 200 calories a pop, maybe not! They were so fudgy, and I loved the pecans and almond slivers in them. Just added a nice crunch! They were also really dense and just really rich with chocolate goodness. If you make these make sure you eat them with a tall cold glass of milk, and that you have many friends to pawn them off on to save your waistline! I ended up dipping them in apple pie Liberte yogurt, making sure to heat up the brownies in the microwave on the second day. SO. GOOD.